Even with all of our modern technology and crazy attractions, the beach is still one of the best places to spend your free time. There’s no better combination than sea, sand, and sun for people who want to get away from city life and drift into a state of total relaxation. Beaches allow us to kick back and sink into the sand, feeling the warmth of the sun’s rays on our skin and enjoying the smell of the pure sea air. They’re also the perfect place to engage in a wide array of fun activities like surfing, swimming, scuba diving, and shelling. There are countless incredible beaches all over the world, but the best ones are often found in sunny locations that get a lot of warm weather, allowing people to really make the most of their beach trips. The islands and nations of the Caribbean are particularly well-known for being some of the finest beach destinations in the world, with Jamaica being a fine example. Great beaches are seen all around Jamaica, but some of the country's most stunning shoreline can be found around the town Ocho Rios. This town is located on the northern shore of the island and was once a fishing village but has evolved into one of Jamaica’s top tourist hotspots. Ocho Rios is a prime stop on many Caribbean cruises, with the town’s terrific beaches offering magnificent views and wonderfully warm waters for all to enjoy. With silky soft sands and exceptionally calm waters, Ocho Rios beaches are ideal for sunbathing, swimming, and soaking up some of the local culture with some Jamaican cuisine and cocktails. Read on to learn more about the best beaches in the Ocho Rios area. Also known as Turtle Beach, Ocho Rios Bay Beach is one of the most popular beaches in the area and one of the first stops for many tourists and cruise passengers. It's really easy to access and has a lot of space for everyone to enjoy without ever feeling too crowded, despite the fact that the beach can get quite busy. The sand slopes gently out into the water, perfect for little ones to wade in. If you want to do some more serious swimming, all you have to do is head further out from the shore. This Ocho Rios beach is also equipped with great facilities like showers and restrooms, and there are plenty of stores and eateries nearby too. 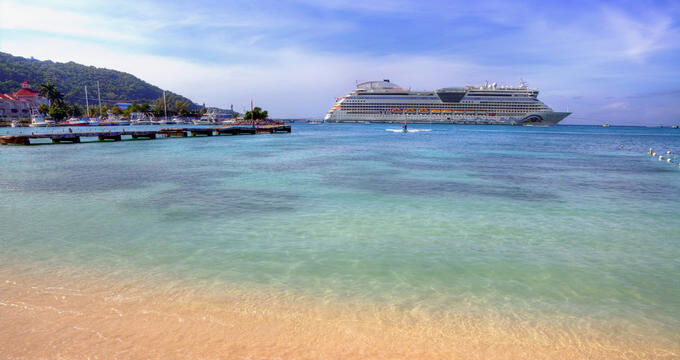 Since this beach is a popular spot for cruise tourists, you can simply sit and admire the ships coming in and out too, and time simply flies by when you're relaxing on Ocho Rios Bay Beach. This uniquely named beach is located in the town of Oracabessa, which is only a short trip outside of Ocho Rios itself. The town was named due to the fact that Ian Fleming, the author who wrote the James Bond spy novels, used to live here and actually wrote over a dozen of the books right nearby. The beach is therefore a big hit with James Bond fans and is a wonderful spot to soak in the water or sunbathe on the sand for a few hours. A local bar serves some delicious cocktails and snacks, and the water is very calm with barely any waves, ideal for youngsters or inexperienced swimmers. Just a short drive outside of Ocho Rios, Bamboo Beach is actually a private beach. Fortunately, most cruise and tour companies operating in Ocho Rios have deals in place to allow their passengers exclusive access to this little slice of paradise. Bamboo Beach is a lively destination with smooth sand and beautiful blue waters. Staff will greet you warmly at this Ocho Rios beach and guide you over to a lounge area where you can lie back and listen to the waves. Fresh cocktails and other drinks are served here non-stop and there's some great local delicacies to try too, as well as a craft market selling souvenirs. A DJ is also employed on site to provide a smooth soundtrack for your day at the beach, and the music is just right, never too loud or overbearing. Few people actually know about Pleasure Cove, but once you discover it, you'll want to come back time and time again. It's conveniently located for Ocho Rios visitors and never attracts big crowds, so it's one of Jamaica's top beaches for people looking for peace and privacy. If you get there at the right time, you can literally have the whole place more or less to yourself. There's a local restaurant and bar serving up some tasty seafood and drinks, as well as offering free Wi-Fi access, and the waters here are nice and shallow, ideal for families with young children or those who just want to paddle along the edge of the beach without actually going for a full swim.